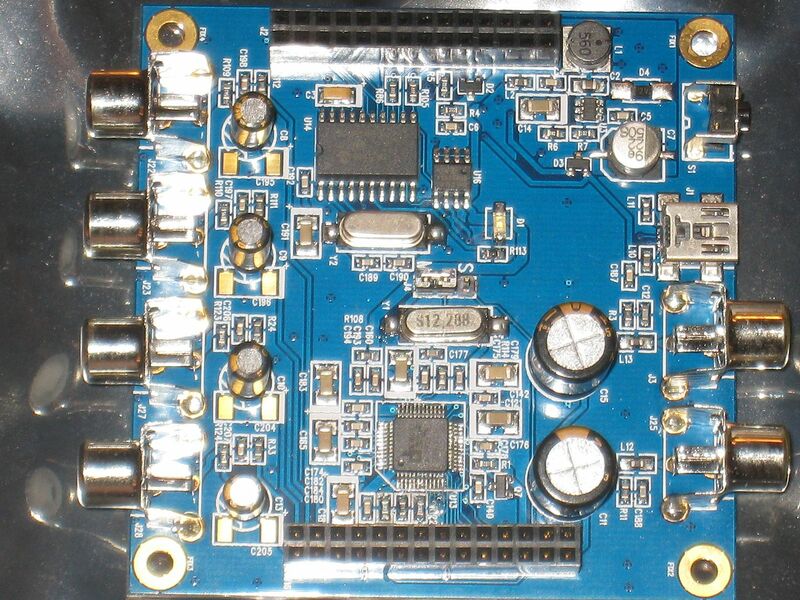 A digital signal processing board with 2 inputs and 4 outputs per board. 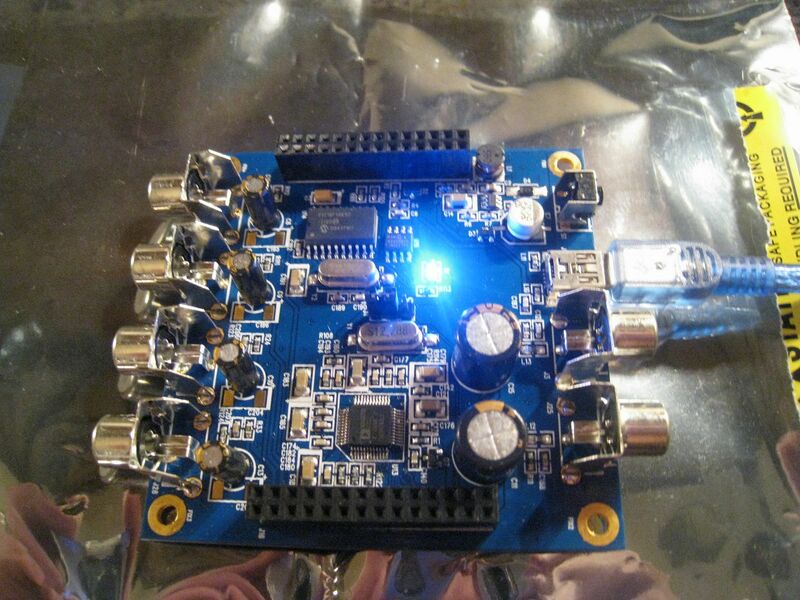 Multiple boards can be connected to make as many output channels as you want. 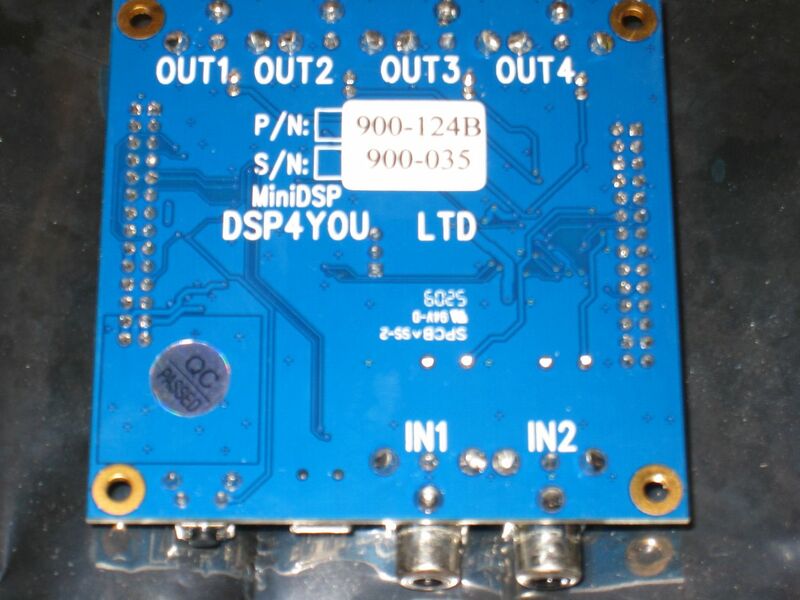 MiniDSP is a flexible, low cost product concept designed to fit a wide range of audio processing applications in a 3"x3" package. With its stackable architecture, it is the perfect fit for your DIY audio projects, custom loudspeakers or Pro-A/V custom applications. May it be the on board unbalanced inputs (2) & outputs (4), one of our stackable I/O card or even your custom I2S interface, our miniDSP kits give you the freedom you've always been looking for. Mix & Match the I/O configuration you need, stack it up and build the unique system that fits your needs! They have an array of boards to choose from. 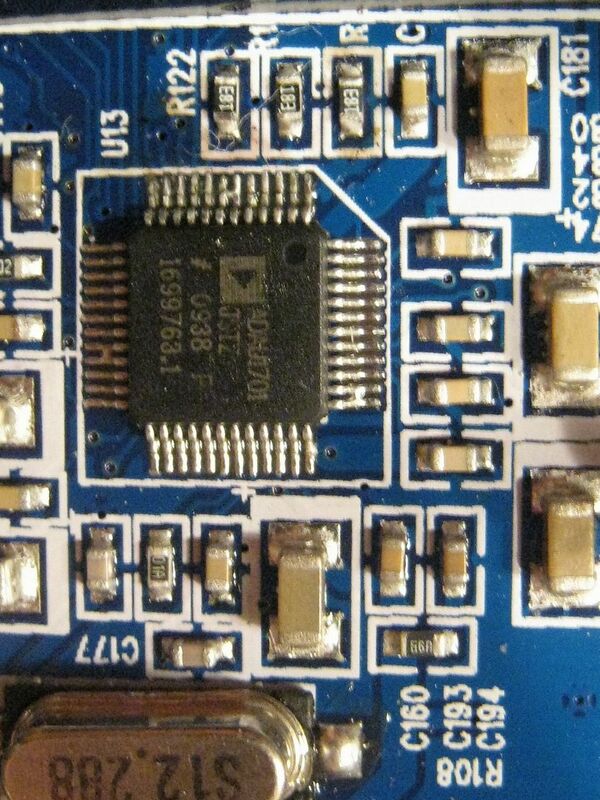 The most basic is an all analog DSP board, called the miniDSP (which this review is based on). For car application, you’ll want the Rev B version if you have a headunit with a high pre-out voltage. Otherwise you’ll clip the inputs. This may seem like a huge concern when looking at the numbers, but read the “Concerns” section of this review to see my findings on the matter. The other option is the miniAMP which is about the same size as the DSP boards listed above, and serves as a class D amp pushing out 4x10w @ 4 ohm or bridged for 2x20w @ 8ohm. A company out of Hong Kong, called miniDSP. Don't be concerned about this. Shipping took less than a week to reach me from Hong Kong. Well, I think the real question is what can’t it do. 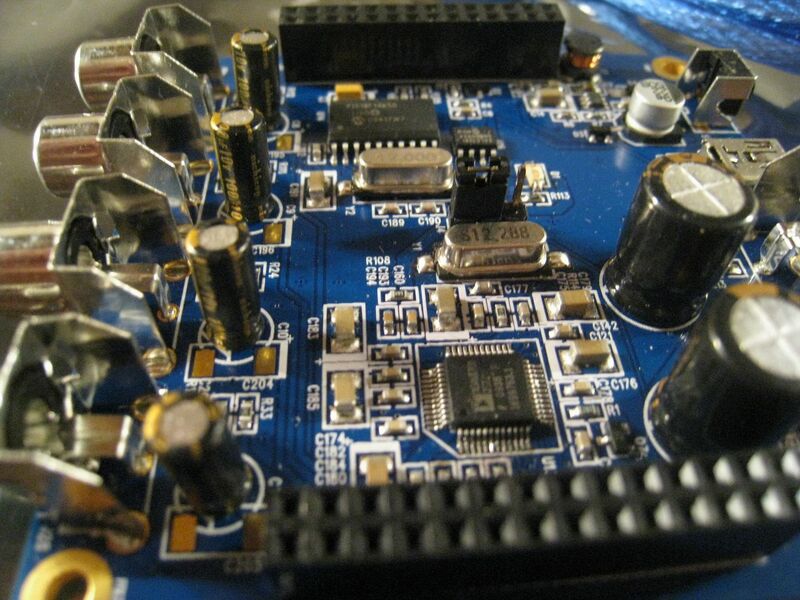 This processor is a standalone board with the ability for multiple options of DSP. So, you can order the board and the software separately. The software is called a “plug-in”. They offer a wide range of various plug-ins varying form a simple 2.1 stereo w/sub setup to a 4-way P-EQ plugin which allows you to have 6 channels of parametric eq per input (2) and output (4). The cool thing is that the company is always updating their plug-ins, and you get the upgrades for free. Once you pay for one version of the software, you’re future proofed. You have many, many options with these guys. In fact, if one wanted, they could have 31 bands of graphic eq + 6 bands of parametric. This would be a great solution for those who want the ability to focus and fix particular problems with a parametric equalizer and then shape the overall output with a 31 band graphic equalizer. The best part about the parametric is the ability to have a Q (bandwidth) as wide as 0.5 or as narrow as 50. That’s insane! Equalizer Types can be standard (Peak) or High or Low shelf. Yea, yea, that's nice. But how much does it COST!? Each board runs only $100 and each plug-in costs only $10. One could have an 8-way setup with both graphic eq and parametric eq for $220+shipping! Here are some pictures of the product. 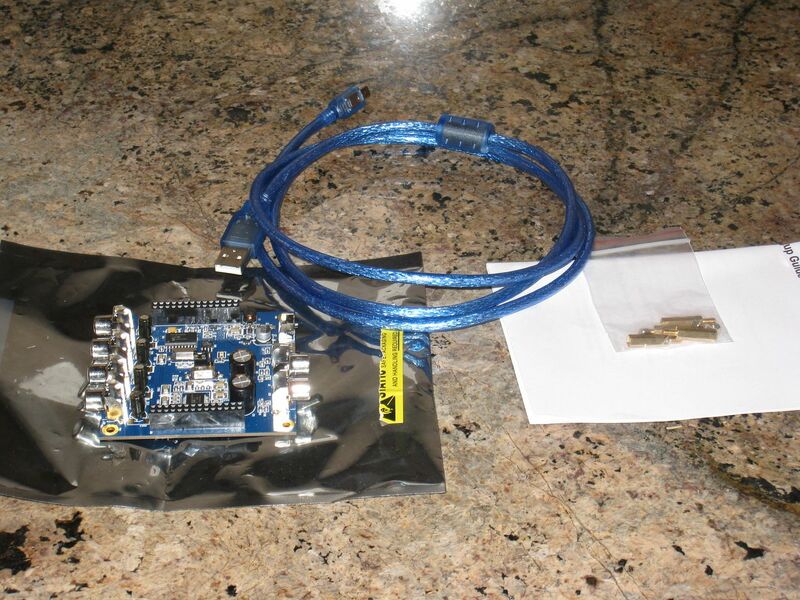 What you get when you order one of these boards is a 4.5’ usb cable, a set of RCA cables, and standoff posts. The following pictures are for you EE gurus out there. I won’t say anything about this stuff. Re: MiniDSP: An excellent alternative! As noted above, this review covers only the miniDSP board and P-EQ plug-ins. For the purpose of this review, I illustrate only the parametric EQ as we all know what a 31 band graphic equalizer looks like. Since the P-EQ is much more diverse than you’re probably accustomed to, I wanted to highlight its features. 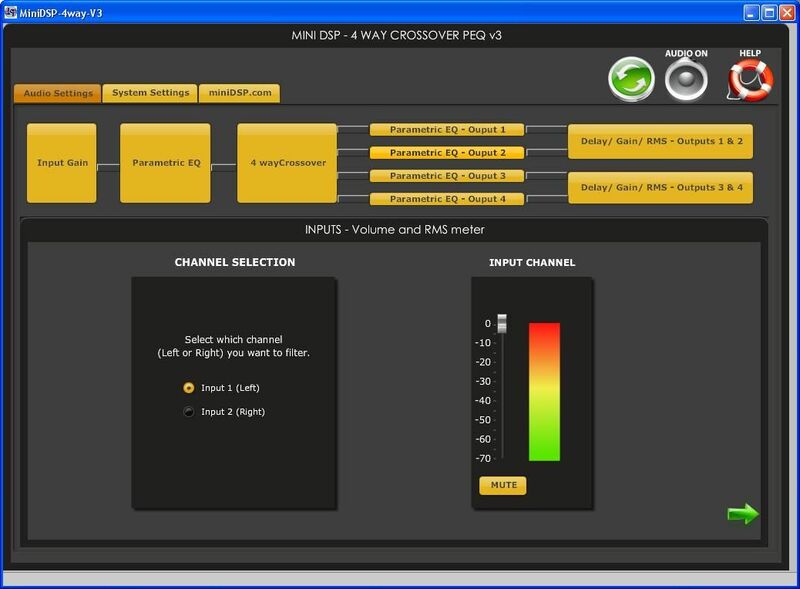 Here’s the input gain screen of the 4-way PEQ plug-in. Note that you can see how the mapping structure links the crossovers. This is different from how the 2.1 screen maps the inputs to the outputs (pictured below 4-way screenshot). 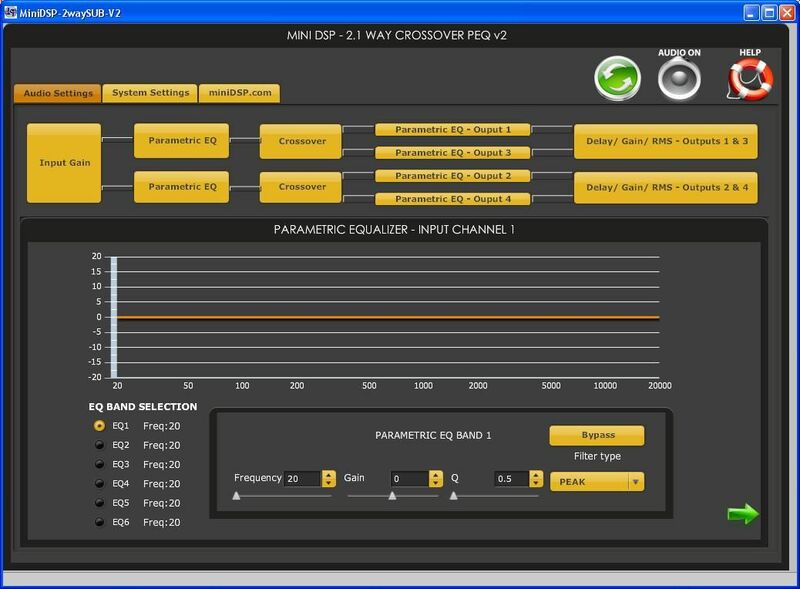 Screenshot of the Input Parametric Equalizer settings. Note that you have 6 bands of P-EQ for each input and output. More importantly, note how you can set the ‘Q’ bandwidth anywhere from 0.5 to 50 and you have a ±16dB swing to adjust the EQ levels. Quite awesome. I know of NOTHING else in the car audio world that gives you this kind of control. And, yes, you can overlap EQ bands. 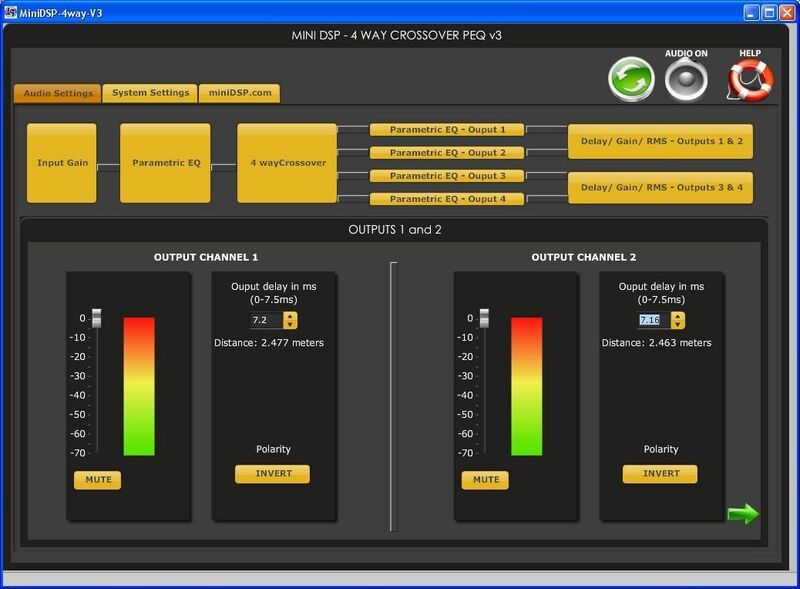 Screenshot of the Crossover for the 4-way PEQ version. Note the various types of crossovers and slopes. The coolest part? You can TYPE in ANY crossover point you want. 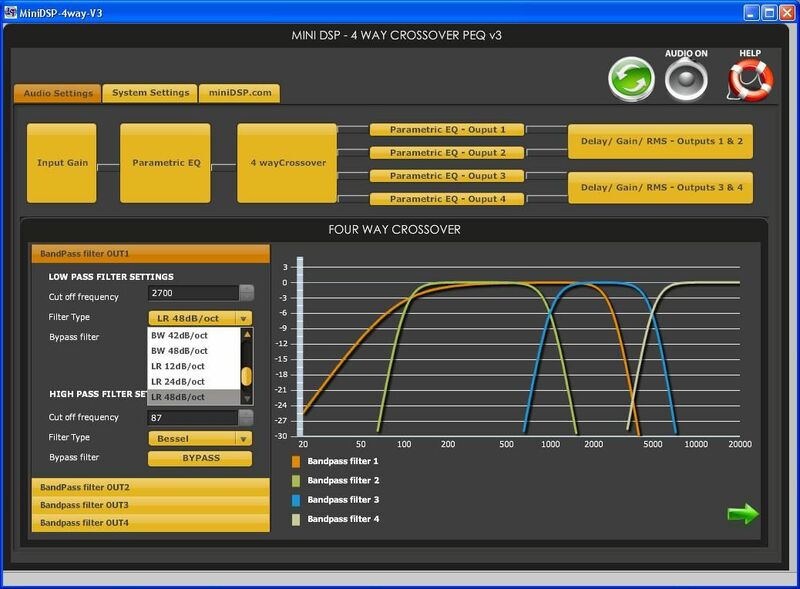 Check the picture to see how arbitrary crossover points can be used. Note that you can bypass the crossover with the push of a button. Output Levels screen, which also has the mute feature, time alignment and phase adjustment. The rated maximum input voltage for the miniDSP is 2v. As mentioned earlier, it seems like it could be a concern and I was worried about it, myself. So, this was something I really wanted to test. I played pink noise FULL TILT on my headunit and watched the input meters. They never once came even close to clipping. This was out of the bitone’s output, with a 60hz tone on the subwoofer channel, and the bitone’s outputs are rated for 8v out. Regarding input voltage, I think we’ll all be just fine. And again, you have an input voltage meter you can watch if you’re really worried about it. This one is a bit more tricky. Long story short is that I had to readjust my bitone’s software output level to about 4dB on the subwoofer channel after using this guy in my car. What does that mean? Simply that I would have had to jack the gains up quite a bit. I meant to take actual voltage measurements but honestly got so caught up in everything else that I forgot to take a final measurement. Bottom line: The low preout voltage resulted in a sound that was noticeably weaker. So, if you guys are worried about cranking the gains on your amps and inducing more noise floor, you might want to purchase a line driver. Due to the layout of this board and the fact that the grounds of the RCAs are seemingly tied to the power ground, there was concern from many others on whether or not this would result in alternator whine or ground loop issues. Unfortunately, I didn’t have the adapter piece to connect to the board’s power harness to check this via a hardwire. I can’t say for sure if you’d have this problem, but it seems you would. There are two ways to power this board, though: 1) hardwire, 2) USB power. 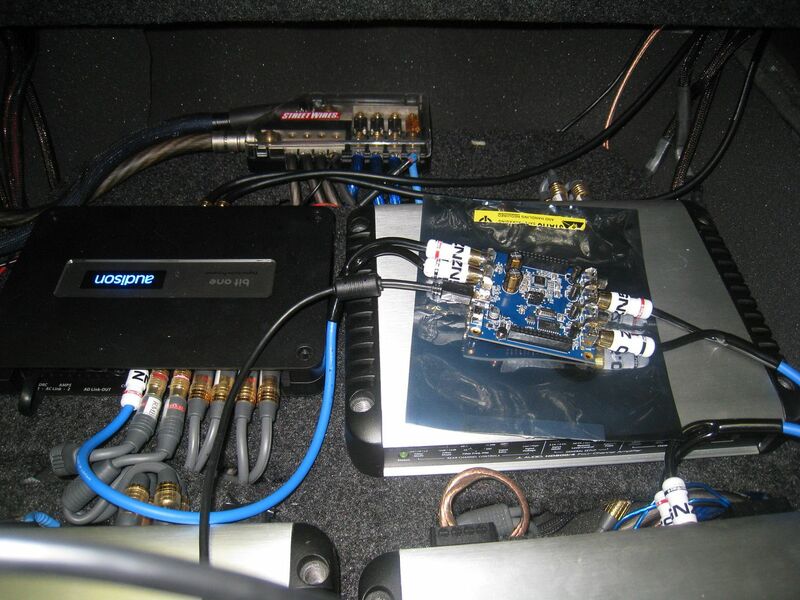 I would have run a cable to the board up the front of the car for front seat tuning with a laptop anyway, so there were no extra steps required anyway for me. If this is not an option for you, then I would consider at the least making sure that your headunit, amps, and miniDSP all share a common ground. At the least. This really may not be a miniDSP problem. It’s really a factor of your system. The reason we get turn on pop, in most cases, is simply because our amps switch on before our signal source does and we’re hit with a sudden pop. Vice versa for powering down. Some DSPs, such as the Audison bitone, combat this by adding a delayed turn on circuit to their remote outputs. So, in my particular case, turn-on pop is not a problem. For those who are concerned about turn on pop, I suggest you look at something like this delayed turn-on device. There are many other options, if you search for them. David Nuvone’s site has a few as well. Again, this isn’t necessarily a miniDSP problem, but it could be a result of you re-working your system. It’s better to be aware of these potential issues than not. Below is a list of the cons I have. I’ve also included an e-mail reply directly from the miniDSP co-founder so you guys can see just what their response is and how willing they are to better the product. I could have re-worded some of these to more accurately fit just how they work, but I wanted you guys to see some of my trip ups and the response on how I was either misunderstanding the software or how it has been fixed. Please read the following carefully, because some of the items have been addressed since I initially typed this section up and put it in the other miniDSP thread and I want people to know that. Sometimes it takes a bit for the software to recognize my commands. I'm using the software on a very capable computer, too. The newest version of the software has sped up the interaction time and I no longer have this complaint. Well done, guys @ DSP. Also, I notice that when I save the settings the board, the 'refresh' symbol is deactivated, and the only way to active it is to 'x' out the air program notifier (which tells you the status of the board/comm). When I do this, it shuts off communication to the baord. It seems that whenever I save the settings, that's all I can do unless I close and reopen the software. This could be a glitch on my end, but I've noticed it happens with both the 2.1 and the 4-way PEQ versions. With regards to refresh symbol, it's not really a refresh symbol but more a "Connect to" symbol. When you click once, you gain access to the board AND synchronize your current plug-in settings to the board. 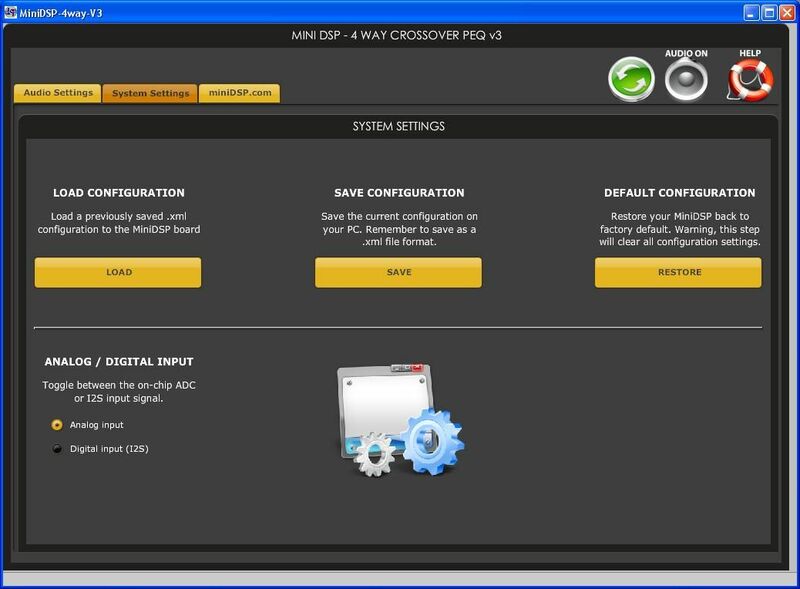 After that, you are live connected (live changes) and any changes you make are applied to both the memory of the miniDSP AND the setting file in your PC. There is no need at all to click save or refreshing anymore, because all your changes are applying real time to the board and will be recalled the same if you were to reboot the board right after that change. The save function is ONLY to save if you want to keep a backup on your PC, that's it. Hope this makes sense. They said it can't be done, but if there's ANY way to be able to control both boards at the same time that would be fantastic. I can speak from experience that switching between GUI's is going to have some ill effects when setting up a system. If you have experience with the Zapco DC amp structure, think about this. Though, I think at this price point, it's something that can be lived with. As for the multi-board, sorry no way as of now. Maybe in the future we can evaluate the idea, but at this point it's actually complex to make this happen both in the firmware AND software. Recommended with 2 thumbs up from myself and 8 from my dogs. This little guy is practically a no-brainer. In my opinion, the ONLY thing that I can see being an issue is the fact that you can’t control two boards at once. But, man, for the price, I think I’d get over it quick. To put it in perspective (and nothing against Zapco), Zapco’s amps are structured the same; you can’t tune more than one without saving work and then going to the other amp. I had 2 DC ref amps, which ran me over $1k. I was willing to deal with the shortcomings of it for a few months even at the price. Scale it down to $200 and it’s nowhere near as severe. It’s like this, guys… we spend $400-700 on processors that have 8 channels of processing. The laptop based DSP tuning may scare some, but if you figure how cheap one of these guys is, you can buy one or two of the miniDSP+plugin AND still have enough money to purchase a laptop to control it with. Just something to consider. The carPC guys have had it made for a long time, but there’s finally something out there for those of us who are scared to go full-bore. This is an excellent middle ground. And, quite frankly, if you are considering a carPC, this may be a great option to do your tuning with. 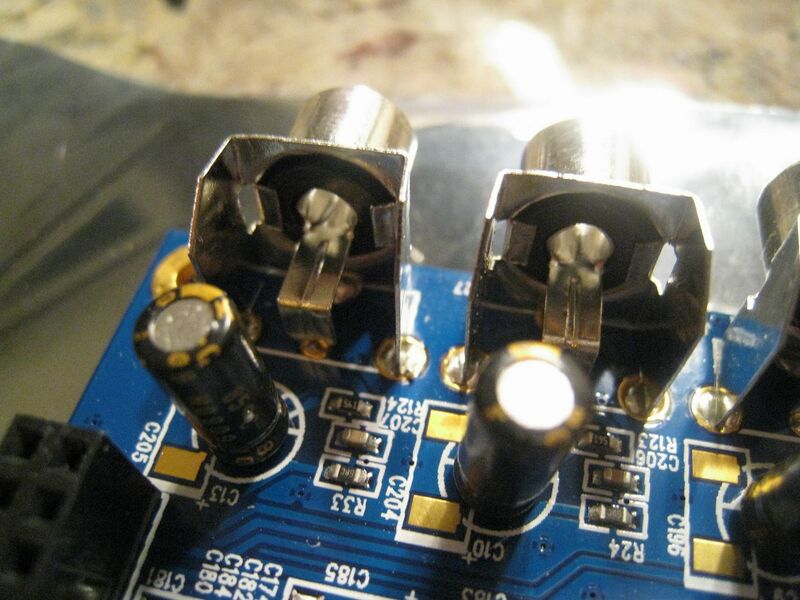 Most of the 8+channel soundcards out there will run you at least the cost of one miniDSP, if not two. Not to get distracted… I just wanted to mention it. Support from this company is like NOTHING I’ve ever seen before. They actually listen to their customers. People asked for the ability to have shelf EQ and they delivered. People asked for high order slopes and they delivered. I must have e-mailed Tony a billion times and he’s always come back with a quick reply. And, furthermore, he’s no slouch. He’s just as technical as anyone I’ve come across and knows his stuff backwards. The best part is that he’s willing to learn and is curious on how he can improve the product. Their website has a support section, and also a forum for recommending future upgrades. These guys listen. I can’t say that for Alpine or Audison. And, with their ‘buy it once’ policy, you’ll never have to pay to upgrade your software. $10 one time and you’re set. So, you want my honest opinion here? If you’re looking for a processor, this should be at the top of your list. The sound quality is just as nice (ie: I couldn’t tell a difference) as anything else I’ve used. The control and abilities are further reaching than anything I’ve used or even seen in the car audio market. The price is dirt cheap. The support is there and will be. I say buy a usb car adapter, a 15ft A-to-mini B usb cable to run the length of the car, a line driver if you want, and get to work. For $100/board I can forgive my gripes listed above. For the DIY’r on a budget this is a steal. And even if you’re not on a budget, you cannot beat the processing power available here. I mean, think about it, you get all the goodies of an h701 or bitone, with even more processing capability. Seems like a winner to me. If you have any questions for me, ask. If you have any questions about the product check out their support forum. We need to find some boxes to throw these suckers into. They're actually making some, last I heard. Or, you can DIY your own. My interest is definitely piqued, especially with regards to the limited crossover selections in most headunits. 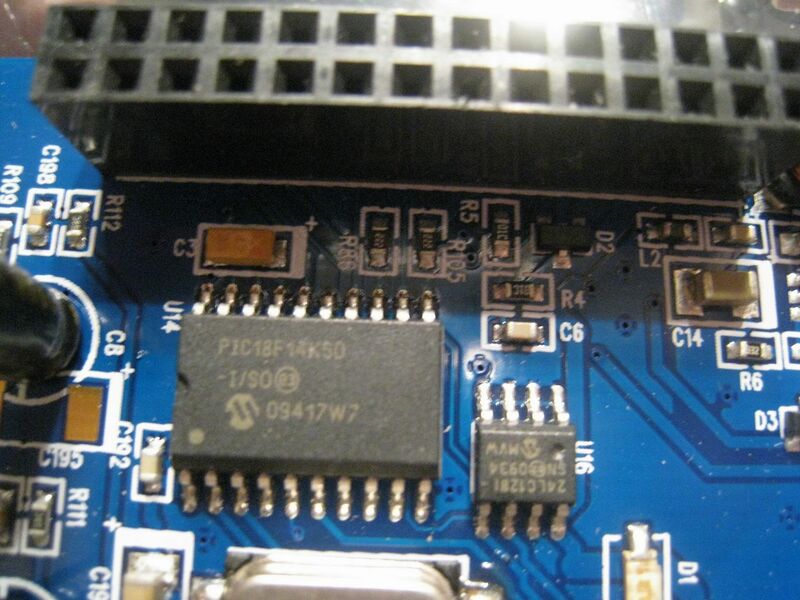 A stupid question: The settings are saved "in" the DSP board itself, right? And another: Once plugged in to RCAs and the amps and all, with the software installed on a laptop and the DSP tweaked, it's ready to roll? It receives power through the USB and that's all the A to B USB is for? You can save a settings file on your computer, though. And, I forgot to mention that results are made in real time. IE: You change crossover slopes on the laptop software interface, and you do it on the board, too. Yes, it powers up through USB. Also receives data that way. Once you make the changes in the software, you’re good to go. The board makes the changes in real time. No complicated save procedure. Pretty cool. Support from this company is like NOTHING I’ve ever seen before. They actually listen to their customers. People asked for the ability to have shelf EQ and they delivered. Great review!! For the price, this is great just to have for screwing around with!!! It is very easy to conflate cause and effect that are unrelated in audio design. In fact, the entire audiophile industry is based upon this ease of fallacy. "Heck yeah you can spend more to get the same sound." Goodness, that's nifty. Thanks for taking the time...thinking about making changes while the car only has cables run is dangerous! I can probably make some boxes to mount these in if needed. I can cut some stuff on my wire edm and waterjet. I might pick some of them up to make one. Or for womanz or friends who don't want/can't afford to go all out on a dsp. Hey Erin, I got two questions and hope you got the info . Can one plug-in work for multiple MiniDSPs or do they need to be purchased separately? Also, each time you access the MiniDSP if using more than one, you have to manually disconnect the USB from one and plug it into the other? Well if it makes less hiss than a 3sixty.2, AND has more abilities,...why not, right? Does minidsp have a website? lol. The Plug-ins can be ran on as many boards as you like, no need to buy another one. Melodic Acoustic "Authentic to the Music"
Another great review, Erin. Don't know where you find the time! But thank you for taking the time and expense to check this out. It seems to be an amazing group of products, especially for the cost. And the support from Tony and company seem very promising! I personally think it would be much better in a Home Audio Environment...I forsee too many UI/Control workarounds for "easy" or universal implementation in car audio, at least for most of the "tweakers" here, including myself, lol. The Processing Power is simply amazing, but when you put something like this in a car, well it's really ALL ABOUT the UI, as you have discovered through all of your experimenting and gear swaps. I'm always the pessimist, sorry, lol. At least the PS solution is easy and inexpensive. I'm not writing these off just yet though. So, will this setup replace your BitOne1 anytime soon? From your included photos I'm assuming that you are using the ANALOG Output from your BitOne1. This is feeding the ANALOG Inputs of the MiniDSP board, and then Output a single Stereo channel Pair via ANALOG Out of the MiniDSP to the JL HD Amp's RCA Inputs? And so far you've tested a single board connected to your system, not multiples, right? I realize that this is most likely for simplicity's sake in quickly evaluating the CAPABILITY of this unit, while at the same time utilizing your existing system (so you don't have to rewire everything). I would do the same fo sure! 1. What happens when you want to take full advantage of this unit's power by using a Direct Digital Source to feed the inputs? For instance using the Logitech Squeezebox Touch which has Analog RCA, and S/PDIF via Optical Toslink, and Coaxial Digital Ouputs. Am I wrong in assuming that most of us here want to utilize a Digital Source? I mean it is 2010, not the 80's, no? 2. VOLUME CONTROL (when using a DIGITAL INPUT into the MiniDSP without a Computer attached for instantaneous volume control). Take your Head Unit and BitOne1 out of the equation for a moment. If you want to send the MiniDSP a DIGITAL S/PDIF or I2S signal (and it will accept both of these, correct?) how would you control volume? A pot or MVC before the amps, or is there a Digital VC available? 3. PRESETS. Would there be any way to implement a small/separate EPROM I/O board with remote hardwired buttons that would allow you to switch between your "saved" EQ/TA/XO group settings WITHOUT the need to have a computer attached? I'm sure we would all like to switch between several different settings such as, Driver Seat Only, Front (Both Front Seats), ALL SEATS, On-the-Highway Curve, Competition Curves, etc. 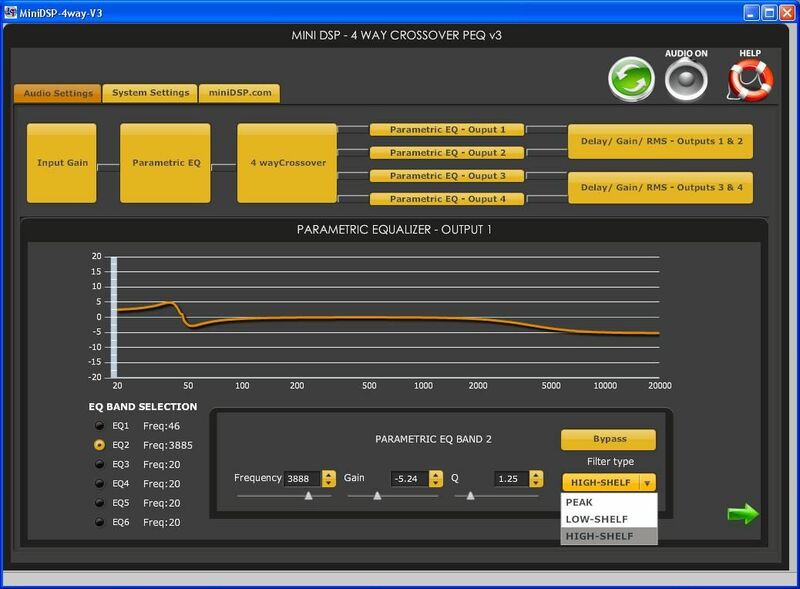 Or just to easily compare different XO/EQ setups on the fly. Home users might want to switch between Classical, Movies, Rock, etc. Control via BlueTooth al a the 360.2, or even WiFi would be ideal. But realistically, I don't see that happening. If so, an inexpensive NetBook or even an iPhone/iTouch/iPad app to control it would be awesome. I guess a NetBook or Tablet via USB would still be pretty slick, since these DSP boards are doing all of the resource-intensive processing on the board itself so they shouldn't be a CPU/resource hog. I guess some of this is dependent upon the software, but you haven't had any problems/hangups using your laptop since Tony made the software changes, right? Thanks for the informative write-up, it is very helpful. 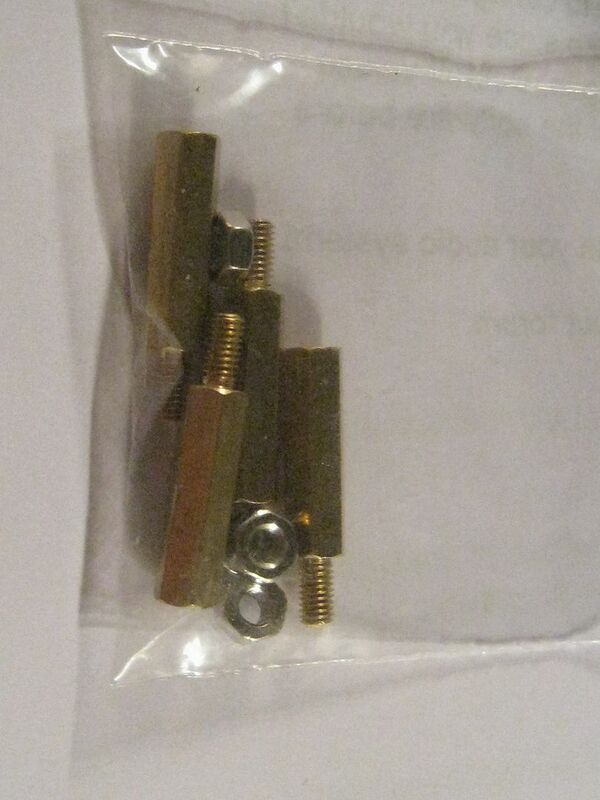 Quick question, one of the pics showed what looked to be mounting hardware. Are these boards stackable? What is the maximum time delay per channel? It looked like 7.5mS on one of the pics, is that correct? 2009 USACi finals: 2nd place basic consumer SQ. Sometimes I get on a roll... what can I say? No, seriously, the hardest part for me is to get started. Once I get started I find that I can't stop (that's what she said). Home Audio was, I believe, the original intended market. Well, I guess I should say that it was the initial market. But, we're so akin, it's an easy transfer. Honestly, it's no harder to put this in your car than it would be to put another processor in. In fact, I'd say it's easier due to less wires. One USB per board for power and that's it. The other things I listed are options. You don't have to have the turn on delay for your amps. And you really don't need a line driver if your amps' noise floor is up to par. Agreed about the GUI, but again, look at the price differential. Is it worth $400-500 for something like the bitone's GUI? That's a tough call if you have the coin. It's an easy call if you don't. Nope. I can't possibly change gear again. I'm burnt out. If I were shopping for a processor, I'd be buying this one, though. I can say that with 100% certainty. They do have digital input boards, as mentioned at the beginning of this writeup. I linked it. It's called the miniDIGI. If you check the support section of their website they specifically tell you how to wire a pot in for volume control. A $5 add-on. Easy as pie. No pre-sets that I see. I honestly don't know how I didn't think of mentioning that to Tony. I don't really see a way to do this, though, without an external screen of some sort, tied to this board. Again, this guy is simple. At it's price, I wouldn't really expect the luxury of pre-sets. they'll answer. They always do. Again, I really suggest you guys look at their site. Most every question you can think to ask has been asked at some point. I've asked Tony tons of questions, only to find a few days later that it had been covered in their FAQ.